Two years later, Church led a study to wipe out PERVs - viruses that tunneled into a pig’s genetic material - in pig cells throughout their genome. PERVs can hop over to humans, making them a nasty surprise for eventual pig-to-human organ transplants. The CRISPR tool efficiently mutated every single PERV gene, roughly 62 copies, in the pig’s cells. Then in 2017, a team led by Dr. Paul Thomas at the University of Adelaide wiped out the Y chromosome with CRISPR in mice. In a paper posted on the pre-publication site bioRxiv, the team found that the key is tweaking base editor CRISPR: a relatively new flavor of the tool that doesn’t snip DNA, but rather swaps one genetic letter with another - for example, turning C and G pairings into T and As. 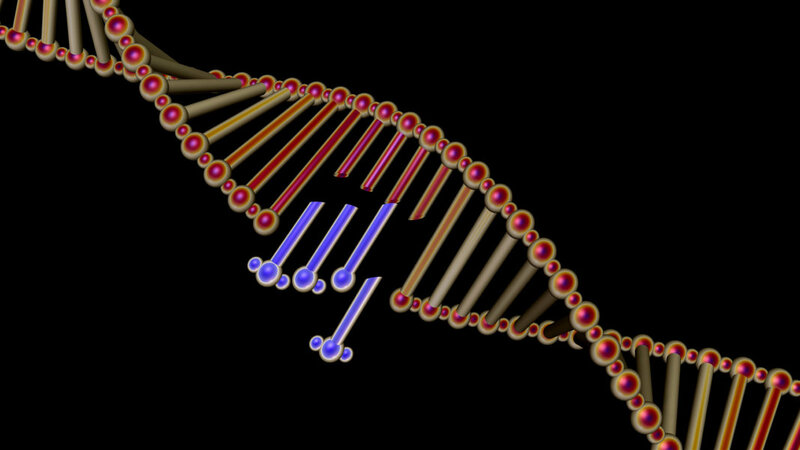 The team engineered a bunch of these to target the “dark matter” of the genome: “jumping” genes littered throughout our DNA, with copies over 100,000 and counting. In two different types of human cells - one cancerous, the other induced pluripotent stem cells (iPSCs) - the team found that the base editors could trigger thousands to over 13,000 changes without killing the cells. iPSCs were more sensitive than their cancerous kin and allowed fewer genomic swaps. A birds-eye overview of the altered genome found few notable side-effects, and the edited cells survived for generations. “Overall I think this is definitely an interesting paper,” said Dr. Gaetan Burgio at the Australian National University, who was not involved in the study, toSingularity Hub. But he stressed that the paper didn’t fully examine on-target - in which CRISPR edited the target site multiple times - or off-target side effects. Or they could irrevocably alter a species - and pass those mutations down in a gene drive, overhauling the natural ecosphere. Here’s where stomping the brakes - or tapping “control+Z” comes in. With gene drives, safeguards aren’t a hindrance - they’re a necessity. But outright bans, such as the recent one tightening genome editing guidelines in humans, likely aren’t the answer. Even Dr. He Jiankui, who gained global notoriety last year by creating gene-edited babies using CRISPR, has his defenders - prominently, Church, who argued that the story is far more nuanced than that of an unhinged scientist climbing to fame. Shelly Xuelai Fan is a neuroscientist-turned-science writer. She completed her PhD in neuroscience at the University of British Columbia, where she developed novel treatments for neurodegeneration. While studying biological brains, she became fascinated with AI and all things biotech. Following graduation, she moved to UCSF to study blood-based factors that rejuvenate aged brains.